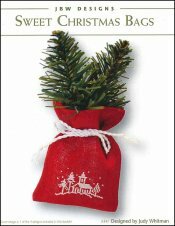 Sweet Christmas Bags [H1472] - $10.00 : Yarn Tree, Your wholesale source for cross stitch supplies. Cross stitch pattern by JBW Designs. Four designs, each with a different Christmas motif. Stitch counts: Heart 48 W x 24 H, Church 40 W x 28 H, Sleigh 50 W x 23 H, and Deer 39 W x 26 H. Stitched on #7539 Belfast Linen latte.